Once you've finished building your computer, you have to face the sad fact that just like anything else, computers do break down from time to time. Hardware can fail, software can crash, and viruses and other malware can infect your system. Sometimes these problems can be repaired without any loss of your data, but sometimes they can't. Computers can also be stolen, and they can be damaged in fires and floods. Sometimes the data on a damaged computer can be recovered, and sometimes not. When it can, it tends to be a very expensive process. It's much better to have good backups than to hope that maybe you'll be able to recover it after a disaster. In addition to hardware- and software-related malfunctions and more classic malware, we now have to contend with "ransomware", which is a rapidly-growing subset of malware that's designed to encrypt all your data (including data in backups that are accessible to the malware) and demand that you pay a ransom to get the encryption key that will allow you to decrypt your data. Even if you do pay the ransom, you still might not get the encryption key. Ransomware authors aren't known for their business ethics. That's why one of the first things you should do after your build is finished is to create a backup solution. I recommend that you make both System Backups and Online Data backups, which we'll talk about further down the page. For a more complete (and occasionally amusing) discussion about computer backup solutions, I suggest you have a talk with the Backup Nut. Before we go on, there are a few basics that you need to know about backup. Let's look at the lingo of backup first. You need to understand these basic terms for the rest of this discussion to make any sense at all. The backup source refers to the drive or portion of the drive that you're backup up. This can be an entire machine, a hard drive, a partition, a folder or directory, or even a single file. Most often, though, it refers to a either a whole drive, a partition of a drive (such as the C:\ drive on a Windows machine), or a folder (such as C:\Users\your_stuff). A backup set or "backup definition" refers to your specifications of which especially vital information you want to back up when doing a data backup. This usually would consist of your documents, favorites, email, desktop, cryptocurrency wallets, and certain system settings. You can also specify everything on the hard drive as a backup set. That would be the safest way to do it, but also requires the most storage space. The target or destination refers to the place where you're sending your backup to be saved. This can be another hard drive (internal or external), an optical drive like a DVD-R, a tape drive, a directory on another machine on your network, or a server located somewhere else when doing online backup. Local backup means a backup stored someplace where you can actually touch it, such as on an ioSafe or external hard drive attached to your computer. It can also mean a backup stored on another computer on your local network, or to a network attached storage (NAS) device (preferably a disaster-resistant one like the ioSafe NAS). Network backup means backup to a machine by way of a network, such as to a local server or another machine on your local network. Remote backup means network backup to any place other than your office or building. For example, it could mean backup to an online backup company like Backblaze. It could also mean a backup of a business's data to a server at another of their offices located somewhere else. The key is that it's remote, which simply means elsewhere from the machine being backed up. Generally, the farther away, the better. Versioning refers to storing more than one version of your backup data, usually based on the date that it was backed up. Versioning is possible when using hard drive imaging (Which I talk about a bit down the page) or when using most data backup programs. FTP, SFTP, WebDAV, HTTP, HTTPS, rsync, and rclone are some of the popular protocols and methods used to actually send the files from the source to the target. Compression is a way to combine files into a single file, and (usually) make the single file smaller than the files it contains. Some popular compression formats include ZIP (the most popular for Windows), as well as RAR, TAR, 7-ZIP, and many others. Compressed files can also be password-protected and/or encrypted to help protect them theft or from ransomware; but there's no guarantee that the packaged, encrypted files won't themselves be encrypted, so don't necessarily count on it. Encryption in the good sense is a way of scrambling up the data so it can't be read while in transit or by anyone who doesn't possess the password or key. It's essential for online backups, and not a bad idea for local backups (someone could steal your backup drive, after all). In the bad sense, encryption is when ransomware encrypts your data in a way that you can't decrypt, and demands that you pay a ransom to get the decryption key. An image is a compressed, packaged backup that must be extracted back on to the device if it is ever needed, usually by using the same software that created the image. A clone is copy of a hard drive. It is bootable if the drive it was made from was bootable, so it could be transplanted into the ailing computer and booted with a minimum of fuss. Clones can be produced from hard drive-cloning software or using a freestanding hard drive duplicator. Clones utilize either block-level replication, which copies literally everything on the drive, including empty space, exactly as it is on the source drive; or file-level replication, which (among other differences) ignores empty space. File-level replication software usually has the additional ability to ignore other files that would be unnecessary for a successful restoration such as temp files, pagefiles, hiberfiles, and so forth; and usually reassembles fragmented files before copying them. I like to make my first line of backup a local one, which means one that I can access immediately if needed without having to download my files over the Internet or travel somewhere distant to retrieve them. I can restore an image of my system to bare metal in about half an hour using a local backup (including the time spent installing a new hard drive, if needed). My favorite local backup destination is my ioSafe. This is a an extreme high-end, waterproof, fire-resistant, external hard drive that can protect its internal hard drive from most disasters. It also comes with an extendable one-year data-recovery warranty, just in case it doesn't. In the event of a fire or flood that destroyed my computer, I would retrieve the ioSafe and check whether the enclosure itself were still functional by plugging it into a computer's USB port. If so, I would restore my system or files over USB. If not, I would disassemble the enclosure, remove the internal drive, and try to access it using a SATA drive dock or similar device. If I still couldn't access the data (which is a very rare occurrence), I would send the drive to ioSafe for clean-room restoration, all under the warranty. ioSafe also make disaster-proof NAS devices that are accessible over a local network. This would be an excellent choice if you have to back up several computers in your home or office. 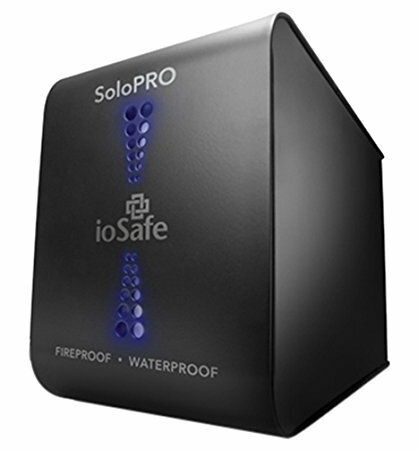 If an ioSafe isn't in your budget, you can use an ordinary external hard drive; but you'll forfeit the fire and flood protection (as well as the data-recovery warranty). You can also use two external hard drives and alternate them between your computer's location and some other nearby secure place (like a bank safe-deposit box, for example). Every operating system I know of comes with some sort of local backup program. These programs range from excellent to just "better than nothing" in terms of the level of protection they provide. Most of these programs create images of your drive or selected data. If your entire drive were to crash or your computer stolen and destroyed, you'd either have to reinstall a basic version of the system, or boot to bootable media like an optical disk or bootable USB drive, to restore the system or data from the image. When the backup software is part of the operating system, it's often possible to use the OS setup media to restore a backed-up image. There also are many free backup programs available for download from sites like Sourceforge. Like free software in general, the quality of free backup software tends to range from horrid to excellent, and usually there is little or no individual support. But there's some good stuff there if you do your research and due diligence. If you'd rather not spend that much time poring over free software, there is a wealth of excellent, inexpensive, backup software. There are several different kinds of computer backups, but most of them fall into one of two categories: System Backups or Data Backups. Let's spend a few moments looking at both kinds of backups. Generally speaking, user-level system backups of workstation computers back up the entire system. This includes the operating system, configuration files, programs, documents, all user data, and usually the boot sector of the system drive. Having a system backup means that if your computer crashes, you can be up and running again in a relatively short time. You will, of course, lose any changes made since the last backup. System backups of servers works a little differently. Typically the operating system and all of its installed software and configuration settings are backed up, but the individual user directories and data may or may not be. The backup administrator makes that decision when defining the backup set. They may choose to back up all, none, or some of the users' data. They may also allow the users themselves to decide whether their data will be backed up. The user directories that are selected for backup are saved along with their settings as archives that can be extracted onto the system after the system itself has been restored. The restore process usually allows the administrator to select which users' directories to restore. The user backups can also be used to restore a user's data if they need it restored for reasons other than a server crash, and usually can be used by a user to move their account to a different server. This kind of backup scheme is common on Web servers. The reason I'm mentioning this here is mainly for the benefit of people who build Linux machines. Many popular Unix backup applications were designed with servers in mind and do not back up everything on the system by default. Make sure you read the manpage or other documentation for any backup software you use to make sure that it backs up everything you want backed up. Another kind of system backup is called a snapshot, which is an exact backup of a system (usually including the user directories) in the state it was when the snapshot was created. Snapshots typically are saved as monolithic archives and have to be restored in total. System backups are desirable if you use your computer for school or work because they minimize downtime. They're also very important if you have a lot of programs installed on your computer, especially games or other big programs that take a long time to install or that save your user information (past and current games and so forth) on the drive itself. With a system backup, everything will be restored exactly as it was when the most-recent backup was made, so you won't have to reinstall all that stuff. The two most common methods of making system backups are hard drive imaging and hard drive cloning. Let's look at the two. Hard Drive Imaging creates a compressed image of your hard drive and saves it to some other place. In the event of a crash, the compressed image is decompressed back on to your computer's hard drive, usually by booting to boot media provided by or downloadable from the software vendor. Imaging programs can usually make incremental or differential backups, which reduce the time needed to make backups between the full backups. The way this works is that the first backup image is a complete picture of your hard drive, which can take a lot of time to create. But after that first image is made, future backups will take less time because they only contain the stuff that's changed. This saves time, but more importantly, it allows you to restore your computer to any of many possible restore points. The ability to have versioned backups can be a lifesaver if you discover that your most recent backup had a virus on it and you need to restore to a point before the computer was infected, or if you accidentally deleted some data or uninstalled some program that you need back. Versioned backups using either incremental or differential versioning make that possible as long as a full or partial backup made before the problem occurred still exists. You simply choose that point and restore to it. But there's a difference between how incremental and differential backups accomplish this magic. Incremental backups only save the data that changed since the last backup, whether the previous backup was a full backup or an incremental backup. This means that incremental backups tend to be very small, so they're usually very fast to create. Unless you installed new software or did a lot of updates since the last backup, an incremental backup usually takes only a few minutes. On the down side, when using an incremental backup set to restore your system, you first have to restore the full backup, and then every incremental backup made since the last full backup, in order, up to the most recent one (or the one you want, if you want to restore to a point prior to the most recent backup). Because of this, it's a good idea to make full backups at least weekly, and make incremental backups in between. This reduces the number of incremental backups you'll have to restore in the event of a crash. Most better backup programs automate the process of successive restores, so at least you won't have to manually restore each backup. Differential backups save all the data that changed since the last full backup. This means that differential backups after the first one following a full backup are usually bigger than incremental backups, take up more space on the backup device, and take longer to create. But on the positive side, when restoring from a differential backup, you only have to restore the last full backup and the most recent differential backup (or the one you want, if you're restoring to a point prior to the most recent backup). Important: Some imaging programs can be configured to overwrite the previous incremental backup with the new one every time it runs, in order to save space on the backup drive or target. This may seem like a good idea, but it will make it impossible to restore to a point prior to the most recent backup if you do it this way. That reduces your restore options in the event of a crash. Hard Drive Cloning is the process of copying a drive exactly how it is, including the boot sector if it's a bootable drive. If the system drive crashes or becomes unbootable or unusable, you just take the clone and swap it in the machine. Presto. You're back in business. Of course, the clone will only be as current as the most recent time it was created or updated. To make cloning work, the target drive has to have the same kind of interface as the source drive (for example, SATA). In addition, if you're cloning a 2.5 inch laptop drive, then the target drive also needs to be a 2.5 inch drive so it will fit in the laptop. Finally, the target drive has to have at least as much capacity as the source drive unless the cloning software knows how to resize partitions. Cloning has some advantages over imaging. The biggest advantage is that there's nothing to decompress. You just pop the clone drive into the machine, boot up, and that's that. It reduces downtime to the time it takes you to physically swap the drive, which usually is only a few minutes for skilled geeks like us. Cloning also has a few disadvantages, however. One is that it's impossible to create a differential or incremental backup using a clone, so you lose the option of restoring to a previous point before the backup was made. Another disadvantage is that certain kinds of hardware failures could cause both the source and the destination drives to crash or become corrupted. Finally, if the clone is available to the OS, then it can also be infected with malware or ransomware along with the main drive. Data backups back up your data, which usually includes your documents, the stuff you stash on your desktop, your email, your favorites, certain system settings, and other stuff that's unique to you. On Windows machines, this usually includes all or most of the stuff in your profile under C:\Users\[Your User Directory]. On Linux or other Unix-like machines, it usually includes all or most of the stuff in your /home directory. In any case, it usually excludes temp files and other useless files in order to save space. The stuff you choose to back up, including any user-selected inclusions or exclusions, is referred to as the backup set. Data backups can be sent to a wide variety of destinations or targets. Some of the more popular local destinations include external hard drives, tape drives, flash drives, or a server or other computer on your local network. I personally stash my local backups on an ioSafe external drive, which is a waterproof and fireproof external hard drive that comes with an extendable data-recovery warranty. They also make NAS versions that are accessible over a network and some of which can be RAIDed for extra protection. You can also do data backups to a second internal hard drive on the same computer, but then you run a higher risk of the second drive becoming infected by a virus, or of a hardware failure causing both drives to crash at the same time. If you choose to back up to a second hard drive, you're better of using an external hard drive and disconnecting it between backups. Local backups are convenient because they're right there in the room with you if you need them. But what if a crook breaks in and steals both your computer and your backup drive, or what if they're destroyed in a fire, flood, earthquake, or other disaster? That's why for the best protection, you need both local and online backup. There are many online backup companies out there to choose from, but my personal favorite is Backblaze. They provide affordable, reliable, unlimited storage that's easy-to use. You can get a free trial of their desktop version by clicking here. Backblaze also offers backup for servers, as well as a very economical service called "B2" where you can back up and store pretty much anything, using any of dozens of available clients and protocols for Windows, Mac, Linux, and many other platforms. I use Backblaze for both personal and business backups, including the computer I'm working on right now and three commercial Web servers (including the one that hosts this site). They're a good outfit. You can also back up your data to any other computer or server to which you have remote access using tools like FTP, SFTP, SCP, WebDAV, rclone, and many others. Basically, any secure server of adequate capacity that will accept your encrypted connection is a candidate for being an online storage target. Most of the time, however, online backup services that are optimized for that particular use are easier-to-use and more economical.